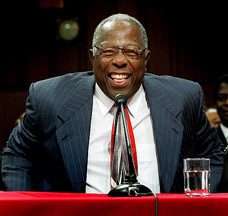 After retiring from baseball at the end of the 1976 season, the great Hammerin’ Hank Aaron set his sights on succeeding in business and helping underprivileged young people achieve their dreams. The business side of his post-MLB life blossomed he became one of the first African Americans to own a BMW dealership, according to Black Enterprise magazine, and owned several other Georgia-based auto showrooms, although he has since sold all but one of the Hank Aaron Automotive Group. And after serving up a steady diet of line drives, homers and highlights to baseball fans for more than two decades, Mr. Aaron’s 755 Restaurant Corp. is now feeding the masses via twenty Popeyes Louisiana Kit chen, five Church's Chicken, and two Krispy Kreme Doughnuts units. 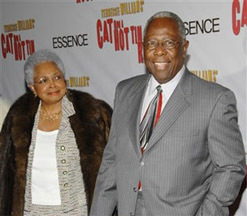 Together with his wife Billye, he founded the “Hank Aaron Chasing the Dream Foundation”, which provides financial assistance to underprivileged youths seeking to pursue their talents and better themselves through education. The 501C3 non-profit received a significant endorsement recently, when the living legend dedicated the new exhibit "Hank Aaron-Chasing the Dream" at the Baseball Hall of Fame. Locally, funds for the foundation come from the Hank Aaron Golf Tournament held each summer in the Milwaukee area. It is administered from Atlanta, Hank's current home, with proceeds targeted toward youths in Atlanta and Milwaukee. His many honors and awards include twenty-four All-Star Game appearances; the Medal of Freedom, awarded by President Bush; and the Presidential Citizens Medal, awarded by President Clinton; and the Boy Scouts of America’s highest honor, The Silver Buffalo Award For Distinguished Service To Youth, which is presented annually to adults who generously dedicate their time and resources for the benefit of America's youth. On February 5, 1999, at his 65th birthday celebration, Major League Baseball announced the introduction of the Hank Aaron Award. It was the first major award to be introduced in more than thirty years, and it was also the first award named after a player who was still alive.